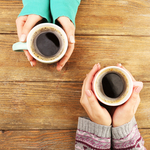 Coffee and addiction recovery, well… they are tied at the hip, so to speak. Actually, it is hard to imagine a 12-step meeting without an urn of coffee. The caffeinated beverage serves three purposes: an incentive for newcomers to come in off the street, helping members stay alert and attentive, and making the coffee a commitment that people in early recovery can sign up for. Commitments being a good practice in accountability, and those who fulfill the obligation show that they are willing to go to any lengths to stay clean and sober. While the drink is synonymous with meetings, its role in recovery doesn’t stop there. At the end of every 12-step meeting you can pretty much guarantee that some members will meet after the meeting at local coffee houses. It is quite common to see people at Starbucks with a copy of “The Big Book” sitting on the table. Sponsors speaking with sponsees, many a Fourth Step has been discussed over a cup of Joe. The link between coffee and recovery has been taken to the next level in a Ventnor City, New Jersey. Not far from Atlantic City, a seaside metropolis known for vice, a cafe is using the profits from coffee and food sales to help pay for people in need of addiction treatment services. New Jersey is one of the many states in this country hit especially hard by the opioid addiction epidemic. Arguably, more people than ever need addiction treatment, although a significant number of Americans can’t afford such services. The Enlightened Cafe in Ventnor has offered a solution, using the profits from the organic cafe’s sales for addiction treatment scholarships, The Press of Atlantic City reports. In fact, the cafe is in the same building as a treatment and recovery center scheduled to open by the end of summer. Jennifer Hansen, co-founder of the Hansen Foundation and CEO of Enlightened Solutions, has been in recovery for more than two decades, according to the article. In this time, Hansen, along with her family, has opened detox centers, treatment programs and recovery housing opportunities in New Jersey. She understands the importance of get well jobs after completing an addiction treatment program, which is why The Enlightened Cafe is staffed by people in recovery. Millions of people across the country need addiction treatment services. With respect to opioid addiction, an estimated 142 Americans are dying from overdoses every day, according to a report from the Commission on Combating Drug Addiction and the Opioid Crisis. If people can’t get help because of costs, community members in other cities would be wise to follow the model of compassion that Jennifer Hansen has laid out. The epidemic is a societal problem, which means we all have a vested interest in seeing those battling addictions get help. If you or a loved one is struggling with drugs or alcohol, please contact Hope by The Sea. We can help you begin the journey of recovery.